August 30, 2014 CAIRO—A Cairo court has sentenced Muslim Brotherhood spiritual leader Mohammed Badie and seven others to life in prison on charges of planning riots, murder and sabotage, Egypt’s state news agency said. The case stems from violence that took place last summer after the ouster of Islamist President Mohammed Morsi, when fighting killed 10 people and injured 20. Egypt’s MENA agency said the court Saturday also sentenced six Islamists to death in absentia. Under Egyptian law, those sentenced in absentia will face a retrial once in custody. Mr. Badie has been sentenced to death in another case but can appeal. Since Mr. Morsi’s ouster, the government’s crackdown on his group and supporters has killed hundreds of people and left tens of thousands detained or facing trials. The GMBDW reported last month that Egypt’s top religious authority had rejected a death sentence for Mohamed Badie. We reported in July on the life sentence received by Dr. Badie in a separate case first reported in June. The GMBDW reported in April that an Egyptian court had recommended the death sentence for Dr. Badie and 682 Brotherhood supporters in connection with the Minya case. The GMBDW reported in March on the first mass sentencing involving clashes which erupted in the southern province of Minya. 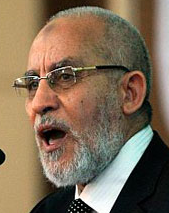 In July 2010, we reported on the election of Dr. Badie as the new Supreme Guide of the Egyptian Muslim Brotherhood. For details on the life and thought of Dr. Badie, go here.